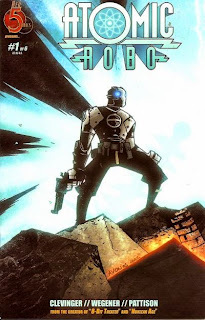 Atomic Robo, created by Nikola Tesla, is the head of Tesladyne, a group dedicated to combating bizarre menaces, as well as conducting scientific research. In his first appearance, set in 1938, he battles Baron Heinrich von Helsingard, preventing him from having the Vril infused into his own body. The Vril is from Edward Bulwer-Lytton’s novel The Coming Race. This and several later crossovers bring Atomic Robo into the CU. The comics portray Robo’s existence as common knowledge, but this must be an exaggeration, as both sentient robots and the kinds of scientific menaces Robo faces on a regular basis are considered mere urban legends in the CU. Vril also plays a major part in the Hellboy mythos. There is, of course, a CU version of Hellboy. The world of Hellboy has now become a post-apocalyptic wasteland so the latest comics can't be considered in. Vril is, however, mentioned in the first Lobster Johnson miniseries which happens before WWII. Lobster, a pulp style vigilante, I think would fit in the CU fine. I do know that Robo battled Yog-Sothoth alongside Carl Sagan, once. There's a Free Comic Book Day Atomic Robo story where Robo has a picture of Hellboy on a wall of his office. Since that story takes place in 1961, Robo must know Hellboy as a real person. Plus, Captain America's shield (or a replica thereof) is on another wall. I don't remember that one. I wonder if I read it and did not notice it or forgot about. Or if I did not read it. A Vril Society is mentioned in James Rollins's novel Black Order, but that might just be an historical reference rather than to anything from The Coming Race. Yeah, that's probably a reference to the real Vril Society.